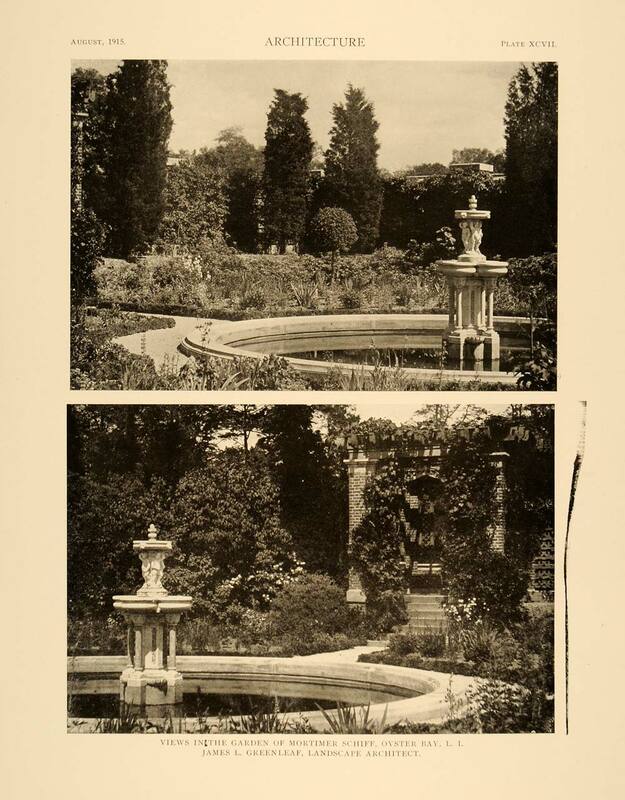 The James Greenleaf designed gardens of 'Northwood', the Mortimer Schiff estate designed by C.P.H. Gilbert c. 1905 in Oyster Bay Cove. Click HERE for more on 'Northwood' which has long since been demolished (and replaced with 'Northwood' II). 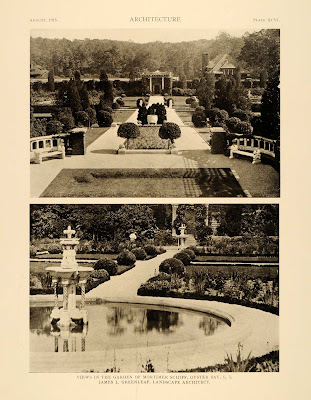 This was IMO one of the most beautiful and expansive formal gardens on LI. (right behind Harbor Hill, Knollwood, Westbury House and Oheka) Once Mortimer Schiff enlarged his tudor style mansion, the gardens came into their own. The scale is breathtaking and some photos show incredible detail of boxwood borders and plantings clipped to such perfection that the gardeners must have used measureing devices. Sad that as in most cases only a few garden walls miscellaneous features remain. It was indeed a fabulous garden. In the first photo, there is a relatively small sunken feature in the foreground that appears to be grassy. Too sunny for a moss garden. I think it is too small for boulle/bocci/lawn bowling, but a logical explanation does not come to mind. Any ideas? When was Northwood II built and why? Croquet? At first glance it looks like low clipped plantings, but on closer inspection it does appear to be a formed border of perhaps grass. Might be a spring garden where bulbs are only featured or a fall garden awaiting seasonal plantings? Maybe after indulging in the fantastic gardens, Zack will provide us a view from the garden looking back to CPH's massive expanded tudor for the Schiff's, just to get our bearings. Northwood II was built by Morti's son in the late '40s by A. Stewart Walker of Walker & Gillette (Gillette had recently passed away). There were so many good landscape designs on Long Island that I wouldn't dare make a list (but if I were, I'd add Oak Knoll, Haut Bois, Black Point for landscapes perfectly integrated with house and site; the dreamlike landscapes of Wheatly and The Orchard; and speaking of orchards, how about the McCann garden at Sunken Orchard? The exquisite garden at Gertrude Vanderbilt Whitney's studio? I'd like to add Sunken Orchard to that list of beautiful gardens. There is always a nit picker in the group, ughhh....starts mumbling something under his breathe but if you include the entire estate property beyond the formal planting beds, then I would certainly include those and also one cant exclude Knole, Ormston and Clayton and, oh why quibble, you are right, LI had an incredible abundance. It is unfortuante that such magnificence was so fleeting. Now to continue lets not forget the Braes, Sefton Manor, etc, etc. Sorry...not to take away from these magnificant gardens, but I'm curious, why was the original Northwood replaced with the home that now stands? Was it due to fire, some sort of damage or simply difference of taste? I think the 90 - 100 plus rooms that it was rumored to have had would have the sons decision fairly easy. Too big to maintain. Zach from looking at the Bing birdseye view is there an easy way to tell where the Nassau County purchased portion (33.5 acres in 2007 for $1M) of the Northwood estate is vs. what remains private? Also any idea when that exceedingly ugly development of 20+ townhomes on Fieldstone Lane (adjacent to Northwood's stables, separated by McCouns Lane) come to be? I know someone quipped yesterday that Oyster Bay was less inclined to allow development but that mess really deflates the argument. Okay this may not be popular but that development on Fieldstone Lane is within the Town of Oyster Bay and the zoning would have allowed much denser development. Oyster Bay Cove is on the other side of McCouns Lane and has 2 acre zoning. That development was the towns try at cluster development, which preserved the green area facing Berry Hill Road, which in fact slopes fairly decently and was an area that local residents wanted preserved. While not perfect that parcel could have held dozens of more homes on tiny postage stamp lots with no green space. I would rather see that type of development explored elsewhere when major garden or landscaping features could be preserved and homes clustered on smaller lots. KJ...not specifically but I can assume it is the southern most portion of the estate as it would connect to the county owned preserve that is south of Northwood and accessed from Sandy Hill Road. The country really got 33 acres for $1 million in 2007? Quite a deal. Around the same time the county paid something like $8 million for 17 acres of 'Easton' to enlarge the Muttontown Preserve (and extend a horse trail). Archibuff, shouldn't Planting Fields be on the landscapes list? And it's neighbor La Selva? And the Aldred estate's landscaping was among the most admired of its era. Oh my, the list of comparables does go on. Nitpicking? Moi? Awww, shucks, thanks for noticing. Had a looked closer I would've seen that there are some cited boundaries: "the site stretches from Berry Hill Road to the west to Sandy Hill Road at the east." It was under Nassau County Environmental Program Bond Acts for Open Space Preservation. archibuff - point taken with OB's decision to allowing some development. There is no way to keep it entirely at bay. One of the small compensations of lost estates is the survival of arboretum-quality specimens in such neighborhoods as Country Estates, built on the site of Harbor Hill and Stone Arches on the site of Roslyn House. A drive through either in spring or fall reveals surviving shrubs & trees, dotted here and there, that shield, soften or otherwise compensate for the loss of the mansions & outbuildings, the heinous "architecture" that replaced them, or just plain poor planning overall. Many developers just plowed whole estates under & started over with bare land. Although I much prefer Stone Arches as an enclave (larger lots & homes), the quality of greenery in Country Estates is, IMHO, superior (albeit suffers from the smaller zoning and recent penchant for McMansionization ––– original "colonial" on left, you-know-what on right ––– of existing homes evens the score). Archibuff: Who owns the stable complex and land on sandy hill road? Is is still owned by the Schiff family. Is it slated for development? For those truly interested in McMansionization (or just plain bored): before and after. Security word - angun: that peculiar mix of anger and anguish one feels when viewing such houses. Such an evocative garden! I didn't realize the scale but it fit the house. At the risk of starting another round on C.P.H. Gilbert, IMO the house was really wonderful looking and the floor plan actually more interesting than most. Why Chip be my guest. You have good taste and let me concur. The Schiff home is indeed great looking and the scale and complexity of the formal gardens were in keeping with the rambling nature of the very large Tudor design by CPH. One of my favorites. I also dont know about the ownership of the stable complex, but it is very well kept.